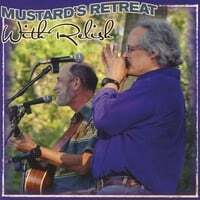 \"Mustard\'s Retreat represents everything that is best about folk music. Their music is community music. It comes from our common roots and traditions, pays tribute to those roots and traditions and expands on them. The disc is a treasure trove of vintage tracks, many recorded in the early 1980s for a public radio show in Flint, that capture the early years of this prolific musical partnership. At the time, Mustard\'s Retreat was popular in Flint as well as Ann Arbor, so then-public radio station WFBE asked them to do their own program. The idea was to bring in local and regional singer-songwriters to play live, but mostly it was Tamulevich and Hough talking and singing. The pair did around 100 shows, Tamulevich recalled. Recently they discovered a number of original tapes, from which more than half the songs for the CD were taken. The rest come from a variety of concert tapes, including \"Do You Think it\'s Real?,\'\' from their original 1976 demo recording. Loved it. Bought a copy for my brother and sister.